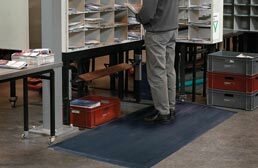 If you have a job that requires a lot of standing, you understand the need for a high quality anti fatigue mat. 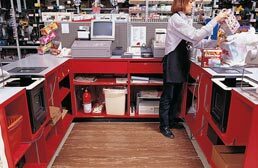 At RubberFlooringInc, we offer a wide range of anti fatigue flooring and mats that will provide comfort underfoot and relieve the stresses of standing. 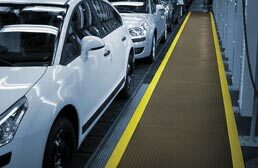 Our anti fatigue floor mats are made of rubber, foam and gel and help to prevent the discomfort of standing for long periods of time. All of our standing mats are very durable and slip resistant and are great as residential or commercial floor mats. Looking for a larger anti fatigue floor mat? 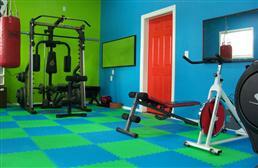 Then our anti-fatigue flooring is the right choice for you. 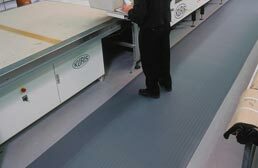 Available in rubber and foam in rolls and tiles, our fatigue flooring is very ‘DIY’ friendly and easy to clean and maintain. So you decided to make some extra money and work a second job at a department store during the holiday shopping season. During the day you work a cushy desk job. Your feet and legs are in heaven. No pressure here at all. But that weekend you pull two 8 hour shifts and your feet and legs feel like they need to be amputated. Sounds like someone has a case of the “No Anti Fatigue Mat” syndrome. This is characterized by intense foot and leg pain that can only be comforted by a nice foot massage. So how do you cure this? Tell that department store to invest in a quality anti fatigue mat! 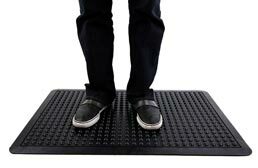 Anti-fatigue mats serve one purpose and that is to provide you with comfort when you are standing for long periods of time. They do this by absorbing the stresses of standing. 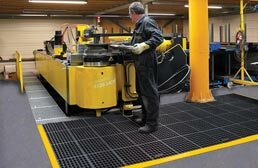 Available in rubber, foam and gel, the anti fatigue mats are great for both commercial and residential applications. 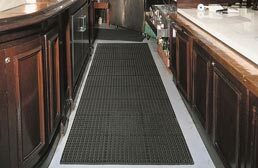 All of our mats have been optimally designed for specific applications and are available in several styles and colors. 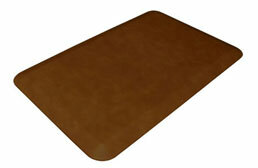 Our anti fatigue mats are very easy to clean and maintain, needing only a broom and mop for stuck on stains. 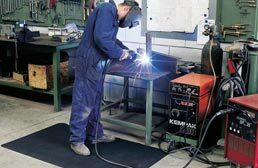 Commercial anti-fatigue mats have been designed to perform optimally in the harsh environments of restaurants, workshops and factories. 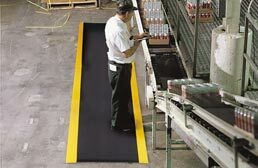 Commercial anti-fatigue mats can either be made from foam or rubber. 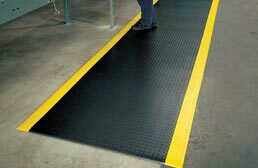 Both foam and rubber anti fatigue mats are slip resistant and provide excellent comfort underfoot. 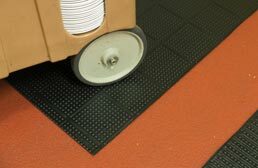 Foam mats provide excellent comfort and relief underfoot while providing a slip resistant floor. 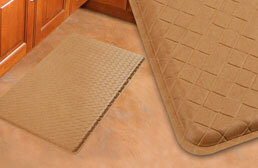 These mats are great in areas where comfort and safety are key. 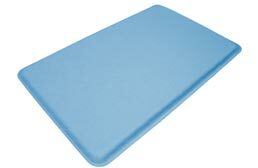 Foam anti-fatigue mats are typically cheaper than other types of mats, but that doesn’t mean they are low quality. It’s just that foam is a cheaper material to make. 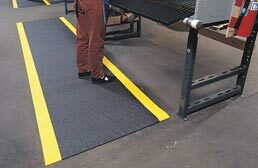 These mats come in several different colors and patterns and are great in office spaces, retail environments, factories and much more. 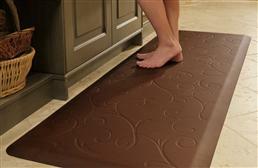 Foam mats are also easy to clean and maintain with just a broom and mop for stuck on stains. 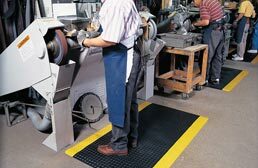 Rubber anti fatigue mats are slip resistant and provide comfort underfoot. So why would you pick a rubber mat over a foam mat? 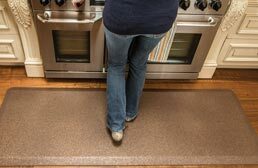 One major reason would be that rubber mats can be placed in areas where grease, water and other hazards may be present. 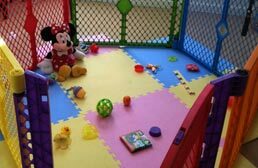 Rubber mats are more durable and can handle a lot more abuse. 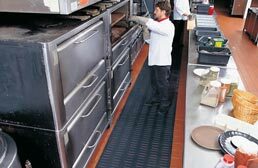 Popular places where you will find commercial rubber mats are in restaurant kitchens, behind bars, in factories, in workshops, and the like. 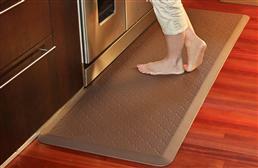 These anti-fatigue mats are very easy to clean and maintain with the use of a broom and mop for stuck on stains. We recommend using a mild soap and water solution. 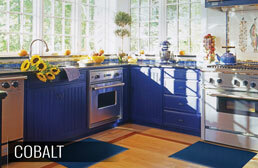 Residential anti-fatigue mats feature more colors and patterns compared to our commercial lines. 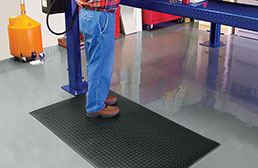 These mats typically feature a foam or gel core - both help to provide comfort while standing. 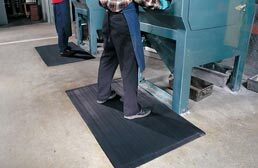 These mats are typically smaller than our commercial mats, and are not built to handle the same stresses found in commercial environments. 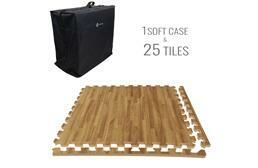 These mats are very easy to clean and maintain with the use of a broom and mop. 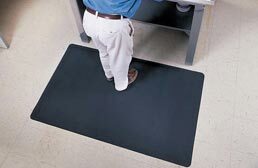 Foam anti-fatigue mats provide you with comfort underfoot foot with a slip resistant top and bottom. The shell is made of rubber, which is more slip resistant when wet. This is great when you are splashing water all over while washing dishes and you have that huge butcher knife in hand. 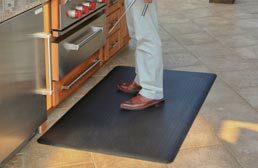 These floor mats are commonly used as kitchen anti-fatigue mats, but can be used in many places in your home, including garage workshops, in front of your grill, outside for gardening and much more. 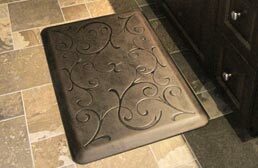 These anti-fatigue mats feature decorative patterns available in several colors. 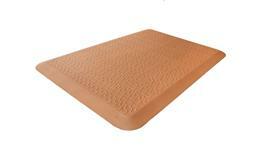 Our most popular foam mats are from our Wellnessmats line. 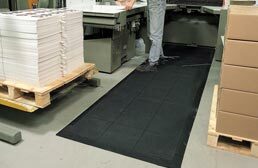 Gel anti-fatigue mats, just like our foam mats, provide excellent comfort underfoot and are slip resistant. Gel mats are unique in that the gel actually conforms to your foot. This helps to reduce the discomfort of standing for long periods of time. 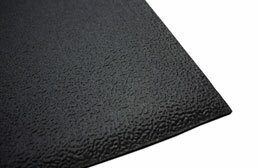 Like our foam mats, they feature a rubber shell and are commonly used in kitchens. 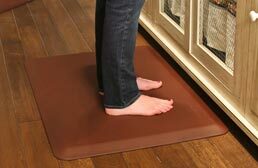 These mats are great for other areas of your home as well and can be found as anti-fatigue mats in garage work shops, as a mat for gardening, as a mat for grilling and much more. 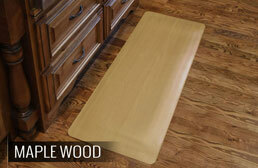 These anti-fatigue mats are available in several colors and designs. 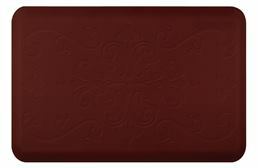 You will find our gel mats are under our Gel Pro line. It’s 5 o’clock and you have been working your trade show booth since 8am. It was a busy day so you haven’t had a chance to sit down. 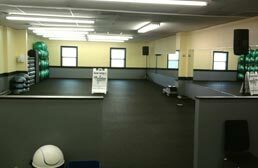 Your current flooring is a rental carpet that has been placed over the hard concrete floor. This carpet has now turned your booth into Hell and the carpet is like a lake of fire. It consumes your feet and legs and the orthotics that you bought gave out hours ago. Where do you go? What can you do to stop this pain? Is there a floor that can prevent this from happening again? Well, yes there is. Anti-fatigue flooring for trade shows is the wind beneath your wings. 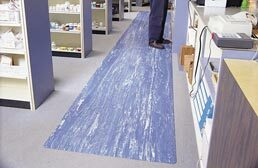 These anti fatigue tiles are great for trade show booths because they are made out of foam and provide comfort under foot. 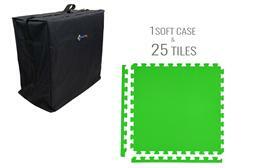 These soft tiles are very easy to install and can be used for multiple shows. 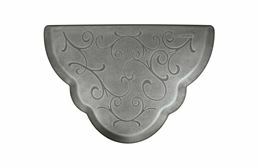 If a tile was to get damaged by a high heel or other sharp object, it can be replaced easily and very inexpensively. These tiles come in several looks and colors with our most popular being our Premium Soft Wood Tiles. These interlocking foam tiles are easy to clean and maintain with the use of a broom and a mop. We recommend using a mild soap and water solution.